Are you searching for a reliable citizens band (CB) radio? In such case, you should allot time to understanding the procedure of selecting the best CB radio carefully. Do not believe claims that license-free two-way radios are not effective since there are reliable ones available today. You simply have to learn how to select one wisely. Since the rise of radio popularity decades ago and its demand’s sudden decline, hobbyists and truckers still find the tool useful; there are still those seeking for the top CB radio reviews. If you are thinking about buying a CB radio, you should have to look at different aspects. These factors do no pertain to the brand and price. Your preferences should match the features that a product guarantees to deliver. Moreover, you should evaluate if a radio is legitimate enough to live up to its claims. Advertisements are easily tweaked, which is why you should be smart in assessing the reality behind the products. This is a mobile CB radio that provides a multiple-color display for improved information visibility. You could set the display in up to four colors. All the radio functions are accessible from its box, and it is very easy to mount. The CB radio also features quick scan and access to 10 National Oceanic and Atmospheric Administration (NOAA) weather channels, giving you forecast of the day prior to traveling. You will be notified if your area will be suffering from the harsh weather during the rest of the day. Its scanning feature automatically covers 40 channels, which will also stop when an activity is detected. Cobra 29 LX 40-Channel CB Radio also has a capability to check the radio concerning its existing functions, such as battery voltage, RF power, and antenna condition. For professional drivers, it has a dedicated on-duty alarm or clock. If you prefer, you may store up to 10 mostly used channels using the CB radio. It also has a memory channel scanning feature. Once the 10 channels are scanned, these will be stored in memory. Talk back may also be modulated using Cobra 29 LX 40-Channel CB Radio controls during the transmission. For maximum performance of the CB radio, you may use its antenna system calibration. If you need to check the antenna, it also has an alert to notify you. Other significant extras of the CB radio are the adjustable Dynamike boost, delta tune, noise reduction, noise canceling microphone, and instant 9 and 19 channels. Similar to the previously featured product, this is also a mobile CB radio. It comes with a box that has highly visible information. Moreover, the information on its display includes incoming signal, power output, the standing-wave ratio (SWR), and modulation among others. 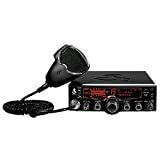 Galaxy DX-959 40-Channel Mobile CB Radio is marketed as the best model under the CB radio series of the brand. It has a long range single sideband modulation (SSB) performance and five digits frequency counter. Among its significant features are its variable output power, microphone gain, end-of-transmission roger beep, talk back, and high-SWR alert among others. The full-featured radio will benefit most of the people who need communications at longer distances. You may use it on your car, semis, and pick-up trucks. The mobile CB radio is best installed on a dashboard with ample space. This two-way communications radio is highly recommended for personal use only. It is not intended for high-impact utilization or industrial application. However, it is powerful enough to be compatible with all CB antennas on the market. Legally, Galaxy DX-959 40-Channel Mobile CB Radio could transmit up to 12 watts, which is higher than the standard 4 watts. Included in its package are the radio, microphone, screws, mounting bracket, mic hanger, and power cord. It is offered with up to two years of manufacturer warranty. This is another mobile CB radio that comes with a weather band and sideband. It guarantees to let you stay connected with emergency bases when on the road. Its weather band is available with alerts for utmost protection while traveling. The information display is highly visible to monitor the signal, power output, and SWR among others. You could even select from seven colors depending on your preferences. The box is partnered with a microphone that has a noise canceling feature for clearer message transmission. At a glance, you will be able to check your levels conveniently, even while driving. It also has NOAA weather alert, giving you forecast for the day prior your journey. 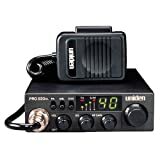 Uniden BEARCAT CB Radio also covers 40 channels, similar to its counterparts. The CB radio has a built-in SWR meter. This will keep your station performing at its best. If you want to check the faults present in the radio, you may use its diagnostic modes. You have superior control over the sound settings. You can find tune the sound and signal of the microphone to enforce clarity despite the distances of communicators. It even has an automatic noise limiter (ANL) option, reducing static sound when the radio is not used. If you prefer, you may use a wireless mic with Uniden BEARCAT CB Radio. Installation of this communications tool is also hassle-free since it is compatible to different vehicles. This is a portable CB radio that covers 40 channels with 10 NOAA weather channels. The product comes with a power output of 4 watts, similar to most standard CB radios. It could be powered by six AA batteries. You may also utilize the CB radio with a cigarette lighter adapter for mobile utilization. Instant access to the weather channel is also granted by Midland 75-822 40 Channel CB Radio. Channels 9 and 19 are also automatically reached by the radio during emergencies. Other significant features of the CB radio are squelch control and automatic noise limiter. Through these features, transmission of clearer sound will be carried out; noise will be eliminated and reception will also be enhanced. Though Midland 75-822 40 Channel CB Radio is designed as portable CB radio, it is still made with a multi-functional display you can read both day and night. For convenient carrying of the communications tool, you may use its belt clip and hand strap. In every package of the radio, you will get complete accessories, such as AC wall adapter, mobile adapter, alkaline battery compartment, antenna, and rechargeable battery compartment. Apart from its automatic scanning of 40 channels, it also has the capability to store your frequently used channels in memory. By flipping the device, you will be able to turn the previously used channel prior to shutting down. This is another mobile CB radio option for you. Similar to its counterparts, it covers up to 40 channels. The microphone is mounted on the front of the controls’ box while the audio output of the CB radio is the standard 4 watts. Unlike other mobile CB radios, Uniden PRO520XL 40-Channel CB Radio has a compact design. Nonetheless, it never lacked in quality when referring to top-of-the-line microelectronics. The construction of the product is inspired by European two-way radios, which could be well portrayed by its less complex structure. If you prefer, you may also connect it to a speaker; this provides leeway for making announcements conveniently. It also has an ANL switch, reducing the static noise and ignition whenever channels are being scanned. The mobile CB radio is designed for emergencies. It has an instant channel 9 access, giving you alerts when necessitated. Adjustments of signal level could also be carried out using its RF meter. Unlike other Uniden models, this version appears to have eliminated the beeping sound that most have complained about. Although the microphone seems to be cheaply made, it has good quality and performance. The installation of Uniden PRO520XL 40-Channel CB Radio is fairly hassle-free as well. Instructions provided by the manufacturer are clear enough for a seamless mounting of the tool. An external speaker could be hooked with the CB radio in case you need one. Before you even jump into a quick answer to the question “What is the best CB radio?” you should learn more about the product. The best CB, as mentioned earlier, should meet your preferences as well. In such case, you must first select the category of two-way radio prior to buying one. Truckers or hobbyists have different requirements when it comes to selecting a CB radio. Most probably, you also have yours as well. Typically, every type of CB radio has pros and cons, which you may weigh when choosing. 1) Mobile CB Radio – This is considered the best CB radios for the modern technology enthusiasts. It is actually made up of a box with controls and a mic attached to it. It is available in different mounting options, such as on the floor, under the dash, or over the dash of the vehicle. You could find this in different shapes and sizes. Varying features are also available with it. If you want a radio for your car, this will likely be your primary choice. 2) Base Station CB Radio – This type may not be the best CB radio for truckers since it is often used indoors. Oftentimes, it is relied on as a home or base unit. The major advantage of this radio is its incorporated power supply. In order to set up a better reception, you may mount its antenna at a higher area. Nonetheless, it could still offer effective range and performance at standard setup. 3) Handheld CB Radio – This is a CB radio that is usually termed as the walkie-talkie units. It works with batteries as power source. It is also applicable for vehicle application since it comes with a cigarette cord. Besides the disposable batteries, you may also utilize rechargeable batteries for this CB radio. Most people purchase two of these to sustain communication when traveling. 4) All-in-Handset CB Radio – In one handset, you could access all the controls under this type of CB radio. The tool has an ergonomic design that sets it apart from the more conventional types of radios. Since it has a more advanced design, even its mounting options are hassle-free. The best CB radio on the market is not the one with the most reasonable price or highly positive reviews. It takes careful assessment before you could conclude a radio is worth the purchase. Moreover, take note that every person has a varying set of wants when searching for a good CB radio. 1) Size – There are truckers who prefer small CB radio, while others do not mind settling with the conventional packages. Do not be fooled with the smaller versions of the product. It is undeniable that the bigger radios will still be the better receivers on the market. Also, bigger CB radios could generate clearer sound. The only problem you have is finding an installation area for the radio. But still, you have the freedom to use smaller CB radios given you are prepared to face difficult setups of antenna and power connections. 2) Material – Regardless of finding the best compact CB radio or a larger package, you still have to look into the material used for the communication product. It is ideal to settle with chrome, metal, or highly resistant plastic. Keep in mind that chrome is expectedly more expensive than plastic radios. 3) Instant Emergency Channels – Apart from the channel scanning feature of the CB radio, it is best to find one that can easily access emergency type organizations. This is best if you often travel to places that are often far from the civilized locations. 4) Weather Capabilities – Newer releases of radios have weather capabilities. This is a feature that will give you up-to-date reports on an upcoming hurricane, heavy rain, or any type of harsh climate. The feature will keep you protected while on the road. 5) Backlit Display – This may be a trivial feature, but it works well during night-time utilization of the radio. 6) Squelch Control – It is totally irritating to hear constant static from radios. This feature eliminates the squelching by transmitting sound only when a message from another radio is obtained. 1) Understand CB Technology – This may sound too outdated, but getting an insight of the technology will help you use the radios more effectively. Shortwave is the term used to describe the radio signal. Depending on the antenna you use, you could keep communication with people at a distance of up to 100 miles. CB radios are not for industrial employees only. You may also use it if you are planning to travel to far places. By using the radio, you will be able to connect to emergency units and police. 2) Follow CB Radio Etiquette – Be reminded that there are other users who can access the 40 channels. According to established etiquette, you cannot talk with another person or base for over five minutes. You must wait at least 60 seconds before you begin another conversation. If you hear people talking in a certain channel, you should wait. When everything is clear, you may perform a radio check. Handles are often used, which are also termed as call signs. Depending on your wants, you could create your own handles. 3) Find the Right Mounting Area – Commonly, radios are installed on the dashboard of a car. It is best to find a location that will impede your safety while operating the vehicle. There are others who prefer putting their radios under the seat. You do not have to be concerned about the installation since newer models of CB radios no longer require modification of cars. The products featured above have their own ways of satisfying CB radio seekers. Nonetheless, it is plain to see that Cobra 29 LX 40-Channel CB Radio is the most recommendable two-way radio in the list. Besides its impressive electronic features, it has a more modern aesthetics that everyone will definitely prefer. Every feature of it seems to be directed to convenience as well. For instance, its display will clearly provide information like your signal without pressing any control while traveling. It even comes with various LED colors to select from. Emergency requirements of a trucker or hobbyist are also granted in every way. You get a weather forecast, emergency alerts, and radio diagnostics. The installation of the mobile CB radio will not even take much of your time since will suit any vehicle’s interior perfectly. Given its price, you do not have to worry about securing a wise investment since its features are worth every penny. Cobra simply won in introducing a package of new CB radio technologies.